Obviously, everyone knows that we went on vacation earlier this month. 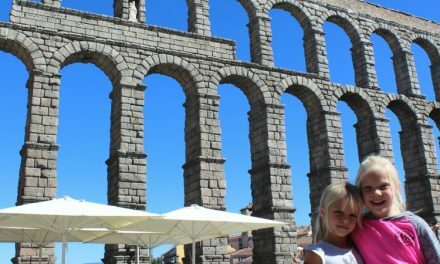 We’ve talked about it nonstop and even wrote a review of the hotel we stayed in. In case you forgot, we did our first “all-inclusive vacation” at the Majestic Colonial Resort in Punta Cana, Dominican Republic. Blah, blah, blah. We know you’re all sick of hearing about it. However, we wanted to share a few of the cooler stories from our trip. First of all, we went parasailing. It was absolutely terrifying! We rode a small powered boat out into the water, and the waves were cresting at about 5 feet high. Then we climbed from one moving boat onto another in order to get to the boat with the parasail. It was terribly unsafe, and I thought we were going to get seriously injured the entire time. On the other hand, it was awesome! The view was unbelievable and it was definitely worth it. Flights Canceled? How About Another Adventure?!? Our second adventure took place after our flight got cancelled from Newark, New Jersey, to Indianapolis. We were supposed to leave at 8:10 p.m. but couldn’t fly out until the next afternoon due to high winds. At first, we were slightly annoyed. Then, we quickly realized that New York City was just a 30-minute bus ride away. Unfortunately, we had no way to book at hotel or do any research ahead of time. We had our laptop with us, but we couldn’t get anywhere with Wi-Fi. Greg looked up at few New York City hotels on his phone but it was extremely hard to do with an android and a low battery. Since we had few options, we just decided to wing it. 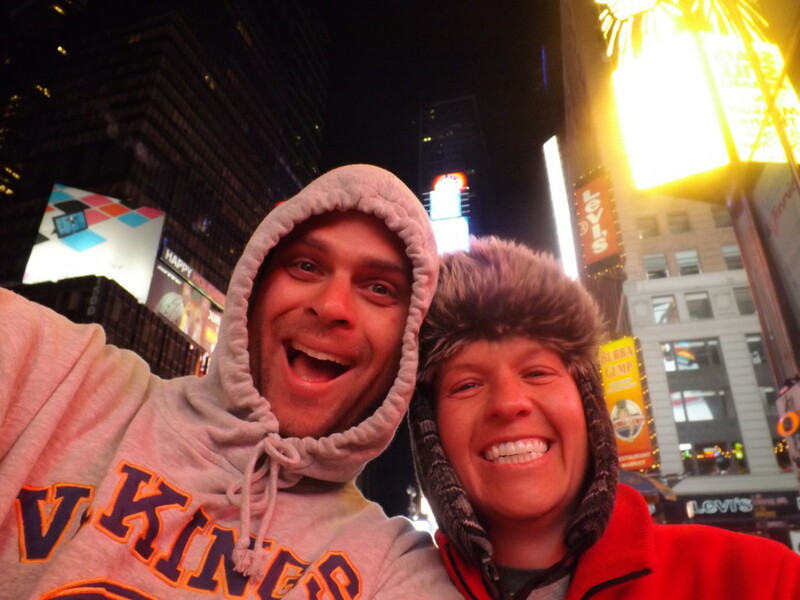 With our luggage in tow, we hopped on a bus from the airport and went straight to Times Square. So, there we were in Times Square with three suitcases, and a lap top bag. Did I mention that it was 18 degrees Fahrenheit…and the winds were gusting at 50 mph? The awesome part about that is that we had no coats, gloves, or hats. We hadn’t brought anything warm to wear! We had no reason to since the weather in Punta Cana was in the mid-80’s. We walked around for a while…looking for a place to stay the night. Luckily, we found a hotel with a an open room on our second try. For $117, we stayed in the craziest hotel room I’ve ever stayed in. It was on the 19th floor, about the size of the bed that was in it, and had a TV with no remote. 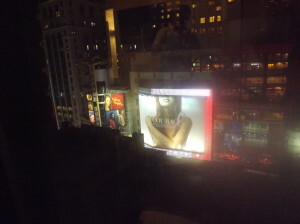 Still, it was at least a place to stay, AND Times Square was directly outside of our window!!! Since we didn’t have any warm clothes, we layered up. I layered two pairs of pajama pants, three t-shirts, a sweatshirt, and a light jacket. Greg layered up 4 t-shirts and had a hoodie sweatshirt. We looked bitchin’. We headed out onto the street and did some shopping. I had a $24 grilled cheese sandwich in Times Square. It definitely wasn’t a frugal dinner, but it was absolutely delicious. Don’t worry…we are still as cheap as ever. However, we were cold and starving and didn’t have time to price shop for dinner! I also bought the ugliest hat known to mankind for $5. Check it out! The whole day was super weird. That morning, I had eaten breakfast on the sandy beaches of the Caribbean. 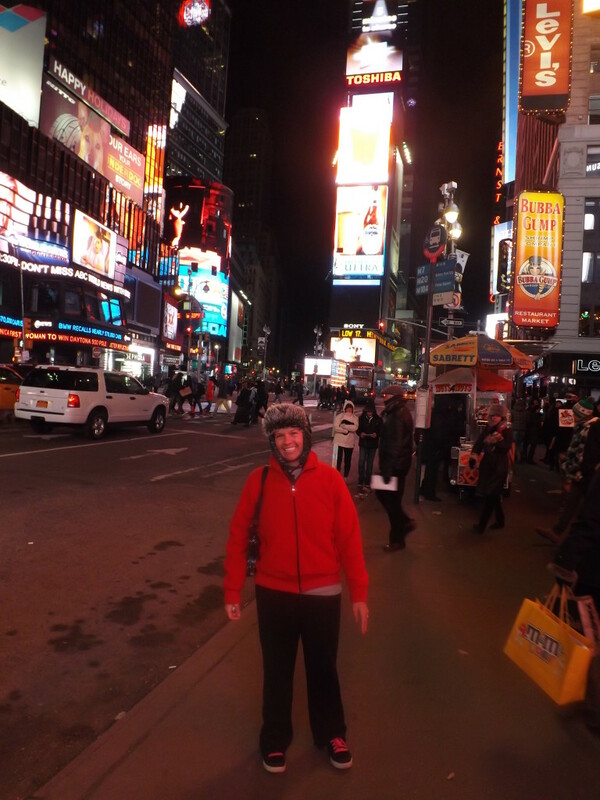 Now, here I was standing in Times square wearing a logging hat……and pajamas. The next morning, we got out in the same clothing and did some more touristy stuff. Luckily, we blended in splendidly with all of the bums. 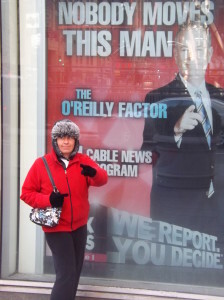 We went to Rockefeller Center, Central Park, Carnegie Hall, and the Ed Sullivan Theatre. We walked around Times Square some more and ate the most delicious vegetarian fast food I’ve ever had in my life. We had an awesome time and made it to the airport in time for our 5:00 flight. 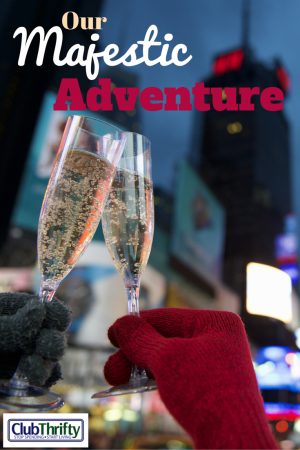 It was definitely a fun adventure, and we tried to make the most of our opportunity. Thankfully, I got to do it all with my partner in crime, the love of my life, Greg!!!!! It was a vacation that I will never forget. Looks like a lot of fun! You definitely can’t eat for cheap in Times Square! It was, and no you can’t! Oh, for FUNNY! LOVE the Vikes sweatshirt, Greg! We’re lifelong Minnesotans and Vikings fans. :-). Thanks for sharing some great stories. What’s a good vacation without a little unexpected fun? yeay for making spontaneous trips to NYC! and for making the most of it! It`ll be something you remember when you`re old and grey and reminiscing about the good old days.. “hey Greg, remember that time we got stranded and went to NYC?” — Cool story! and about that parasailing adventure, that looked so terrifying and simply awesome at the same time! It`s definitely on my Bucket list! We had a great time! It definitely will be one of those stories we can look back on and smile about. Love your pictures! 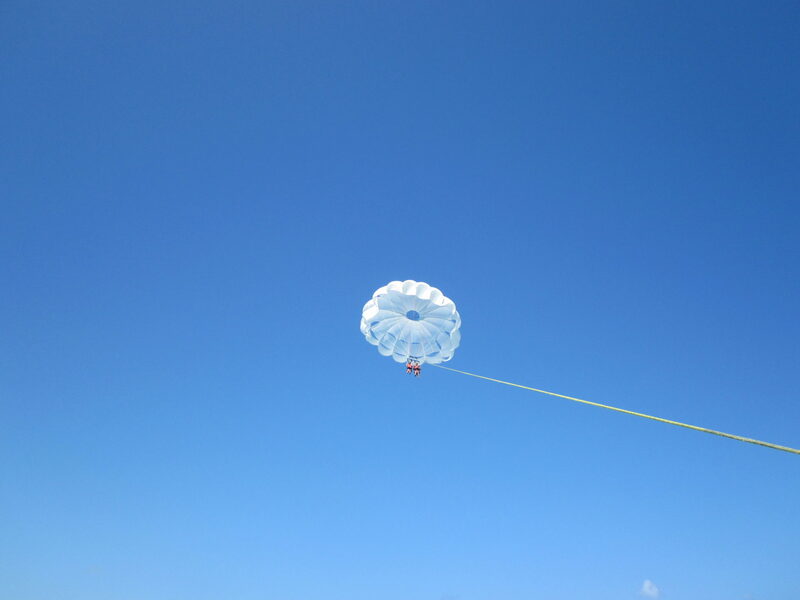 I’m so jealous that you went parasailing! It was fun to be that high up. The views were amazing! haha I can imagine you freezing in NY looking like fat snowmen with 5 layers! I did the delayed flight day excursion a couple of times, but the airport always had lockers so it was more convenient. $120 for a hotel room and $25 for a sandwich wow, I hope the airline refunded it. Unfortunately, they didn’t refund it because the flight was canceled due to “weather.” Ugh. Sounds like a blast. Nothing beats the impromtu things that you don’t plan on but turn into a blast anyways. One time a friend and I were in NYC and it was freezing cold and raining, and we had planned a day of outdoor stuff which we realized wasn’t going to happen. We saw that there was a showing of ‘The Producers’ coming up and went up to see if tickets were available. At first they said, no, then as we were turning to walk away they said ‘Wait…’ and two tickets in the sixth row had just opened up. Awesome! Sweet! That sounds like fun. I love NY! Since we already had to use an extra vacation day, why not make the best of it, right? Love the Vikings sweatshirt! Skol Vikings! 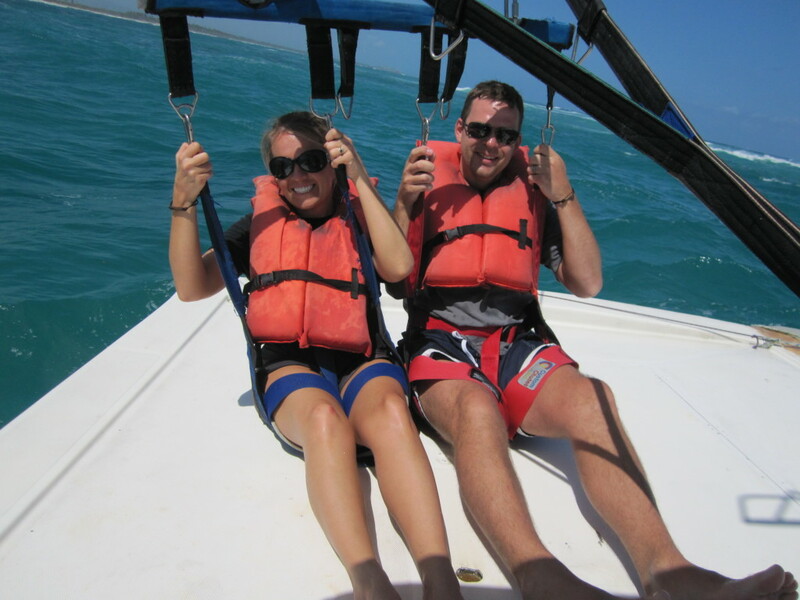 haha but anyway I have never gone parasailing and it definitely looks a bit scary. I would be up for trying it if I ever get the opportunity. Skol indeed😀 Parasailing is a lot of fun. I’d recommend doing it, at least once. I had a $24 grilled cheese sandwich in Times Square. Holy crap; is this a typical price for TImes Square? Never been there, but I’m packing food if this is the norm whenever I do make it there! It is pretty expensive to eat in Times Square. We were at a sit down restaurant, so it was a little more pricey. You can get fast food or food from a pizza or hot dog cart for much less. Looks as though you just took the delay in stride and made the best of it. I grew up in New York and I would find 18 degrees uncomfortable after living in California for 40+ years and no warm clothes. It was pretty chilly. It wouldn’t have been so bad, but the wind was really blowing hard. Great way to turn lemons into lemonade! The pictures are wonderful and you may have started a new fashion trend with the hat! 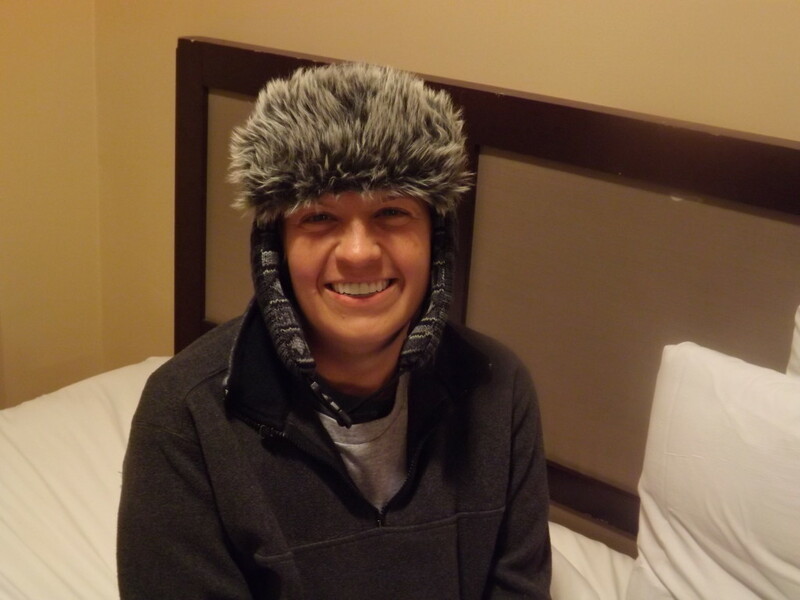 I love that hat by the way…hahaha…might have a fuzzy one that’s kind of like it? Oh, that hat is going to be going into our memories box, for sure. Awesome! I’d love to go to Hawaii. Absolutely! Thanks for dropping by! I love it. You certainly made lemonade out of a lemon of a flight delay. Good thing you weren’t in Des Moines or somewhere like that. Although maybe Des Moines is the center of the universe for night life for all I know. That is an awesome hat too. We were glad to be in a cool place as well. We love to go “off the map” so that made it fun. Luckily, I’d been there once before, so I had a decent idea of where I was at. What a grand adventure! Sometimes impromptu trips are the best. Glad you found a safe hotel room in NYC for $120 – that’s kind of amazing! NY prides itself on being a bit eclectic, so they probably never even looked twice at your pajama bottoms! You two are adorable – thanks for sharing the pics! Awww! Thanks Shannon 😀 You’re right, nobody even noticed us. We were kind of surprised to find a hotel room at that price too…although I’m not entirely sure how “safe” it was. Ahhh, parasailing looks fun, I want to do it. I might have a small heart attack, but it would be fun. That’s the best attitude you can have when traveling. If something doesn’t work out, then go with it and make the most of it! We did our best, and it was a lot of fun! Way to turn a crappy flight cancelation into a positive! Looks like you all had fun on your night out in NYC. Did you take any pictures of the grilled cheese? I kind of want to know what a $24 grilled cheese looks like! That is awesome! Way to make a fund adventure out of an otherwise crappy situation. Thanks Kyle! We had a blast! Well, you just may have to whip us up some grilled cheese for lunch someday Jacob! I’d like to go back but I have a feeling it’d be a lot more expensive with me footing the bill. New York is a great town! I love it there. Definitely in my top 5 favorite cities. Sounds like you had a great time. It’s kind of funny how you’re both in sweaters and everyone else is all bundled up in scarves, hats and gloves. Your hotel room in Time Square sounds like one we had in Chicago. The room had two twin beds that were four feet long. My brother, father and I were supposed to squeeze in there somehow, all six foot tall. Luckily we were given a different room, this time with two of the biggest king sized beds I’ve ever seen. Was super weird. That is funny Justin. I’m guessing that would have been a tight fit! You are hilarious! Looks like yall had a blast! We did! I’m glad it happened…but we were definitely ready to get home the next night. What a way to make the best of what you are dealt. Glad you enjoyed your time and bitchin’ hat Holly! Way to take advantage of the situation! Unplanned trips are really fun, I’m glad you took advantage of a bad situation. What a brilliant way to make the best of a bad situation! 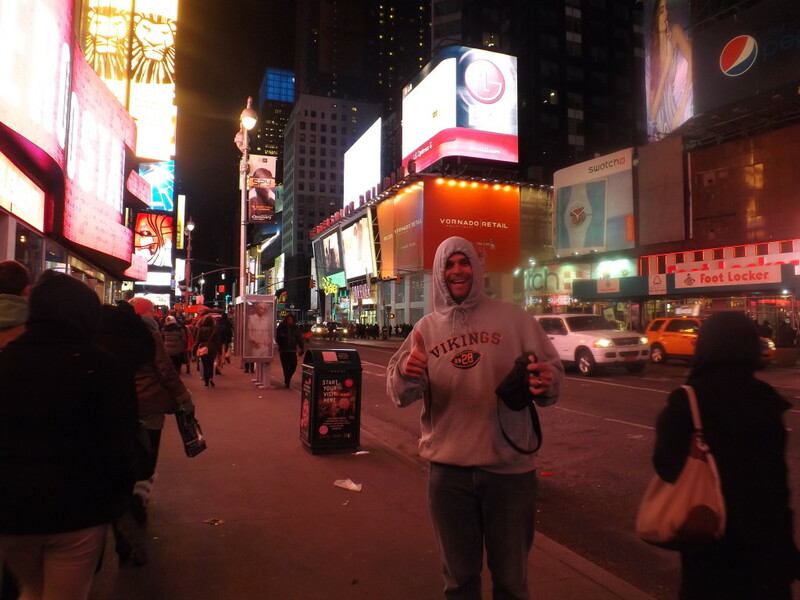 Love NY, even overpriced Times Square! You guys surely had so much fun. Wish to do that this summer.